OUR GOLF, YOUR WAY: Rickie Fowler coming to Ayrshire. 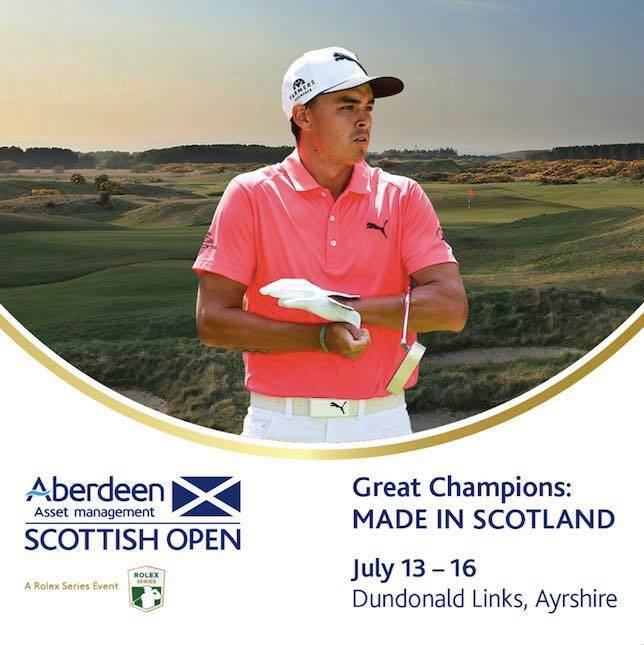 Rickie Fowler will bid to reclaim the title he won in 2015 when he tees it up at the Aberdeen Asset Management Scottish Open at Dundonald Links on July 13-16. The 28 year old American surged to a thrilling victory two years ago to secure his maiden European Tour title, two months after winning The Players’ Championship for the first time. Fowler fell two shots off the lead when he bogeyed the 14th in the final round at Gullane Golf Club, but birdied three of the last four holes to overtake Ryder Cup team-mate Matt Kuchar and Frenchman Raphaël Jacquelin to finish 12 under par and seal a memorable win. Currently 9th on the Official World Golf Ranking, Fowler added the Abu Dhabi HSBC Championship to his list of titles in 2016, and will be aiming to make it three European Tour wins in three years when he returns to Scotland, the Home of Golf, in July. This will be his third appearance at the Aberdeen Asset Management Scottish Open in four years, after finishing tied eighth in his debut appearance at Royal Aberdeen in 2014. This year the event takes its place as part of the European Tour’s new Rolex Series, a premium category of tournaments each with a minimum prize fund of US$7million. With the significant prize fund increase and greater Race to Dubai points on offer, Fowler joins a world-class field, including World Number Two Rory McIlroy, The Open Champion Henrik Stenson and former Masters Tournament winner Adam Scott, on the North Ayrshire coast in the week before The 146th Open Championship. Fowler said: “I’m really looking forward teeing it up at the Aberdeen Asset Management Scottish Open again. I had to dig deep on the final day for the win in 2015, and it rounded off a special week for me in front of the Scottish fans. I had to dig deep on the final day for the win in 2015, and it rounded off a special week for me in front of the Scottish fans. As well as a world-class field competing inside the ropes at Dundonald Links, there will be a host of entertainment for spectators to enjoy outside the ropes, including a free American Golf show, a host of family entertainment and a wide selection of food from local suppliers.